Jane C Woods, aged 59 years and 4 weeks. My first selfie! 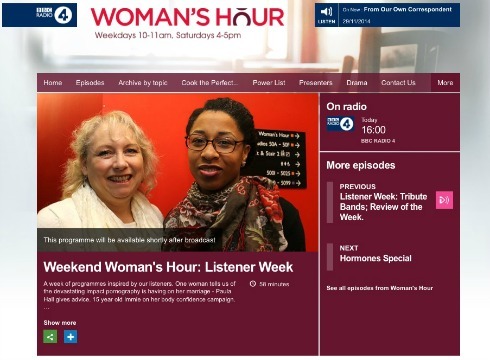 I might just have mentioned (ahem) that I was in London last week to do a wee slot on BBC’s Woman’s Hour. As well as being a great deal of fun (and it’s fabulous to meet your heroes and realise they are just as lovely as you always hoped), it also gave me an unexpected insight into the world of female celebrity woes. 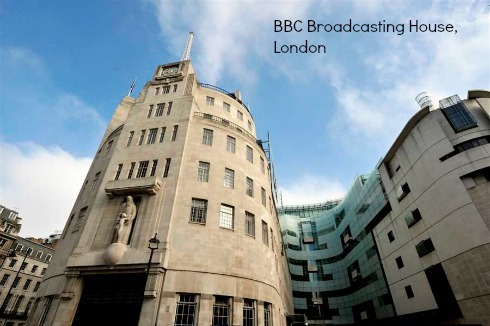 So when my husband suggested that we could walk from our hotel to the BBC Broadcasting House in the heart of Central London I happily agreed. It was a beautiful autumn morning and only a few minutes walk. Yes, I could feel my hair curling off my head in the dampness but I didn’t care. It was radio! We arrived, were shown to the green room and met the other contributors. A photographer arrived to take a picture of myself and Dr Nicola Rollock; together we were reviewing the Listeners Week on Woman’s Hour. I did notice that Nicola was immaculately coiffed and ran my fingers somewhat wildly though my hair to lift it’s clinging tendrils off my face, but that was sum total of my efforts. We were taken into a corridor for the pictures, both laughing, and I thought no more about it. Do let us have the photos we gaily called as we returned to the Green Room. But it has seriously made me think. I occasionally idly flick through celebrity type magazines at the hair dresser. There are a couple which seem to delight in snapping the most unflattering pictures of women that they can, and it’s almost always only women who get the ‘bad hair day’ treatment. For some reason Dawn French seems to be in the frame at the moment (literally). There were a plethora of photos of her in all sorts of unflattering guises, like walking to shops in the rain etc. Photos over which she had no control. I began to understand why sometimes people in the public eye get obsessed with how they look. From my lofty position of no one giving a fig what I look like, and certainly no paparazzi hanging around outside my house waiting to see me in my (torn) nightie getting in the milk, I can easily say, women should not worry what they look like. But, if if my income depended on it, if I were caught up in the world where women’s looks are paramount and dissected at every turn? I begin to have a glimmer of understanding of how this can erode your confidence on a daily basis. With all the wisdom of being 59 I know I’d rise above it, as does the wonderfully talented Dawn French. But at 29, how would it have affected me then…? Note to self: be less judgemental, more understanding. PS Here’s the picture my 29 year old self would probably have not shown you but I’m told this is how I look. And there’s me thinking I was a Joanna Lumley look alike! 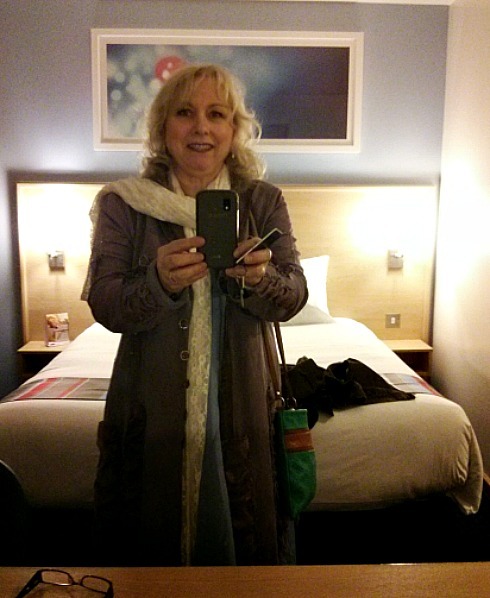 PPS The ‘selfie’ at the top is me just a few hours later, (look no white hair) in proud Mum mode off to see last night of New Old Friend’s tour of the Falcon’s Malteser, starring my son and daughter in law! Which was totally brilliant. You might enjoy reading Should airbrushed women be allowed? But actually, frizzy hair or no (and, to be honest, who cares? Yours looks just fine to me) your personality shines out, Jane. Beauty is, in the end, pretty dull. Whatever might interest the tabloid editors and briefly occupies a few people on Twitter aside, most of us are fundamentally pretty Meh over appearances. In the end, we connect with what makes people real and human to us – the quirks, the enthusiasms, the vulnerabilities. That’s what’s really interesting. Well done for sitting there in the hot seat at Woman’s Hour! I know what it’s like, having done it myself about 15 or so years ago. Takes balls. You’re brilliant. Ah, you are a darling woman!Thank you. 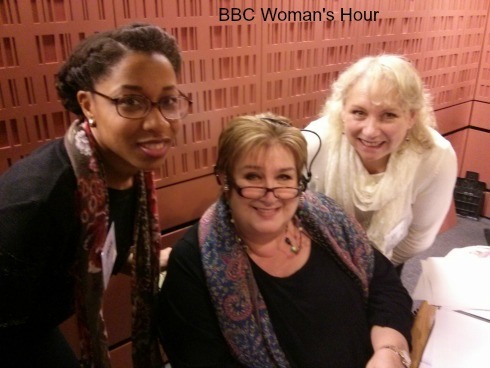 What were you on Woman’s Hour for?